Add a gallery link to your client's Dubsado portal with just a few clicks! 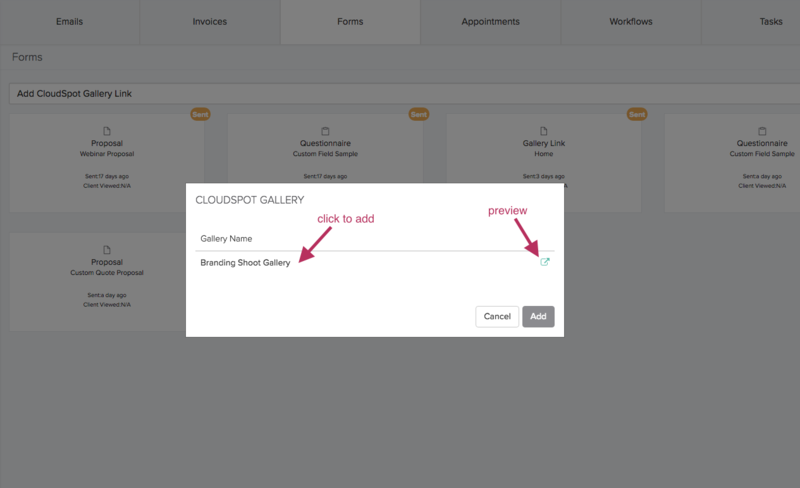 Once you have created your galleries in CloudSpot (learn the how to for that here), you will need to log in to your Dubsado account and head to a job or lead page. Under FORMS you can pick from the dropdown "Add CloudSpot Gallery Link"
Once you click to add a gallery link, it will pop up with all available galleries that you have not added yet. This will now add it to the job. MARK SENT - puts the link in the client portal for clients to access there. We are excited for part 1 of our integration and look forward to all the more possibilities ahead with our friends at Dubsado! 📣 CloudSpot users save 20% off FOR LIFE when you upgrade to any monthly or yearly plan with Dubsado!